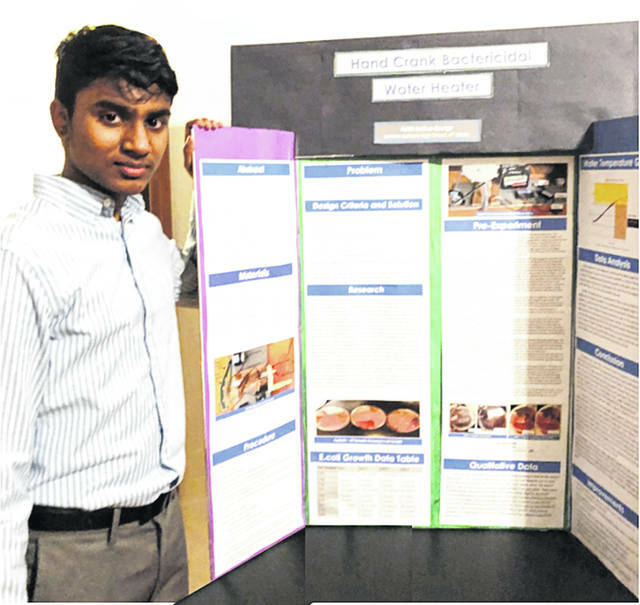 Lehman Catholic Freshman Adith Joshua George received the highest rating of 40 points for his project: Hand Cranked Bactericidal Water Heater. SIDNEY — Lehman Catholic High School held its annual Science Fair recently in the Pride Family Gymnasium. LCHS students submitted 57 projects to be exhibited and judged. Twenty- three students received superior ratings, qualifying them to participate in the district competition. Students must earn at least 36 out of a possible 40 points to receive a superior rating. Two Lehman students received the highest rating of 40 points for their projects — senior, Kaila Sims for her project: Which formula is the most similar to Breastmilk? and freshman, Adith Joshua George for his project: Hand Cranked Bactericidal Water Heater. Alexis Bollinger – What effect does starch have on a liquid? Michael O’Leary – What is the predatory time in an African clawed frog? David Rossman – What is the accuracy difference in three light source printers? Kate Stewart – Which drink decays teeth the most? Alexandra Casillas – Which natural materials clean up oil the best? Jon VanSkiver – Do magnets affect regeneration in planeria? Angela Brunner – Fluid with the optimal pH and ascorbic acid to reduce GI side effects in iron absorption. Allison Bornhorst – Which antibiotic is best at halting bacterial growth? Cole Gilardi – The most efficient airfoil. Lily Greene – Do all proteins denature at the same temperature? Nicholas Largent – How does the cold affect a hand warmer? Mitchell Sollmann – Does the pH of water affect Zea Mays Identada growth?